Firestone is blessed with an alternating climate of warm sunny days followed by brisk coastal afternoons and evenings. Diurnal temperature swings of up to 50 degrees are normal during the summer growing season. Our location is warmer than areas to the southwest (Santa Rita Hills) and to the north, yet cooler than the eastern areas of the AVA. The result is a viticultural “sweet spot” with a long growing season that is suitable to a plethora of varieties. Firestone’s estate vineyards are set along a series of mesas composed of sandy loam with rocky sub-soils. These well-draining, low-nutrient soils minimize vine vigor, which leads to more concentrated and balanced varietal flavors. Firestone is located in a viticultural “sweet spot”. 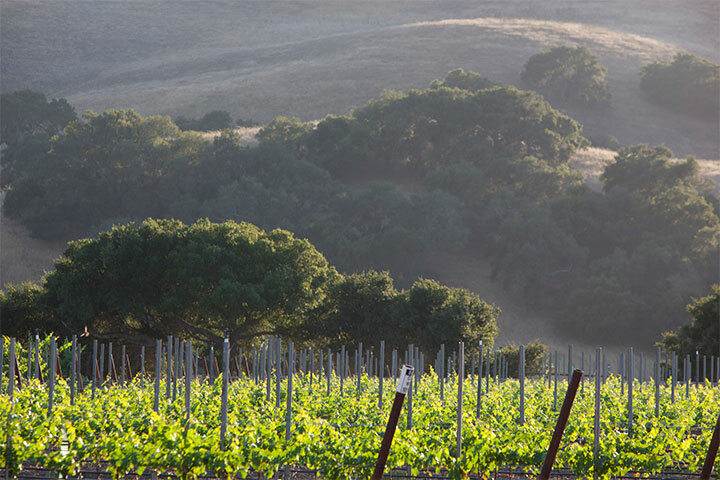 Firestone Vineyard is committed to sustainability. The estate vineyard program is focused on achieving optimal physiological balance through aggressive canopy control, irrigation management, crop management and other methods. These protocols are implemented on a varietal-specific basis, calibrated to the natural vigor and growing patterns of each vine to ensure steady and complete maturation.